There is a travesty in America today, that involves taking perfectly tasty, healthy, natural foods, full of vitamins and fiber, and doing unspeakably nasty things to them. I’m talking about sweet potatoes. First, some background. Sweet potatoes are a tuber from the morning glory family, and there are two major types available in the U.S. The first type to be widely cultivated are those that remain fairly firm after cooking. The second type which became widespread later, become soft. 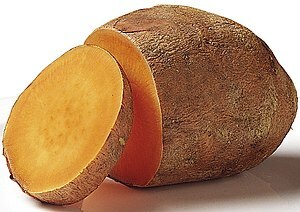 As a staple in the South, the softer types were frequently called “yams” by the African slaves, since the soft sweet potatoes were similar to the yams of their native land, and the name stuck. True yams are related to grasses, and are starchy and drier. They serve as an important staple in Africa, but are generally not available in the U.S. except in specialty and ethnic food stores, such as African or Caribbean markets. 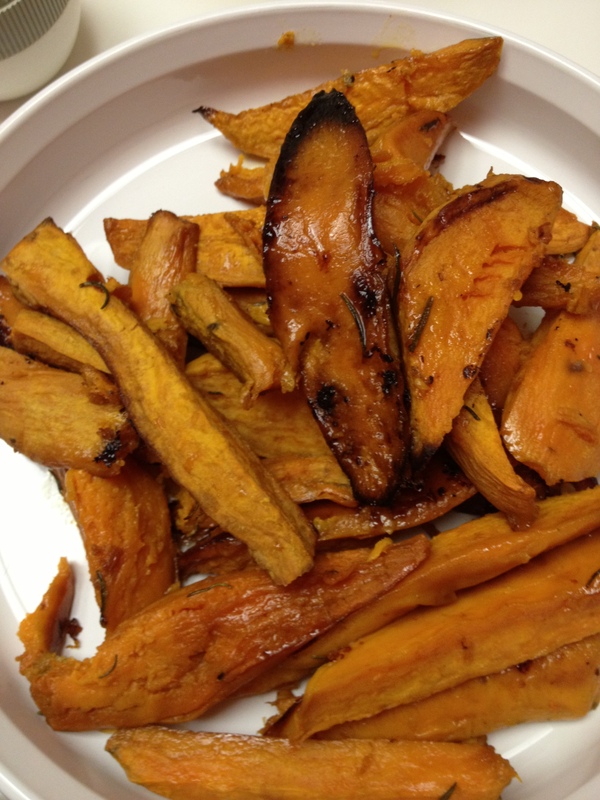 The “candied yams” you may have been served as a child are actually sweet potatoes, assuming you are from North America. An 8-oz serving of sweet potato contains about 270% of your daily vitamin A requirement, and up to 50% of your vitamin C needs. A similar portion of true yams would have 1% and about 25%, respectively. Both have, of course, a lot of fiber and complex carbohydrates. Why would you want to screw something like this up by heaping sugar and marshmallows on it? Why would you fry them up and then add cinnamon and sugar? What is wrong with you people? Are you the ones that buy that pumpkin pie filling stuff in a can because, oh I don’t know, adding your own milk, spices and sugar to canned pumpkin is too much work? I digress. A plain baked sweet potato, accompanied by a bit of butter, is not sweet although it will have a caramelized roasted flavor. That’s the only way I ate this growing up, until I was invited to a holiday meal where the hostess served the sweetened whipped potatoes covered with marshmallows and roasted until they melted. I took some, of course, to be polite, but I found the natural flavor covered up by the spices and sugar. It hurt my teeth. Do not despair. I’ve made the following sweet potatoes at holidays for several years, and my sons eat so many that I started preparing extras for them to take home, as these reheat nicely. Preheat your oven to 400 F ( 204 C). 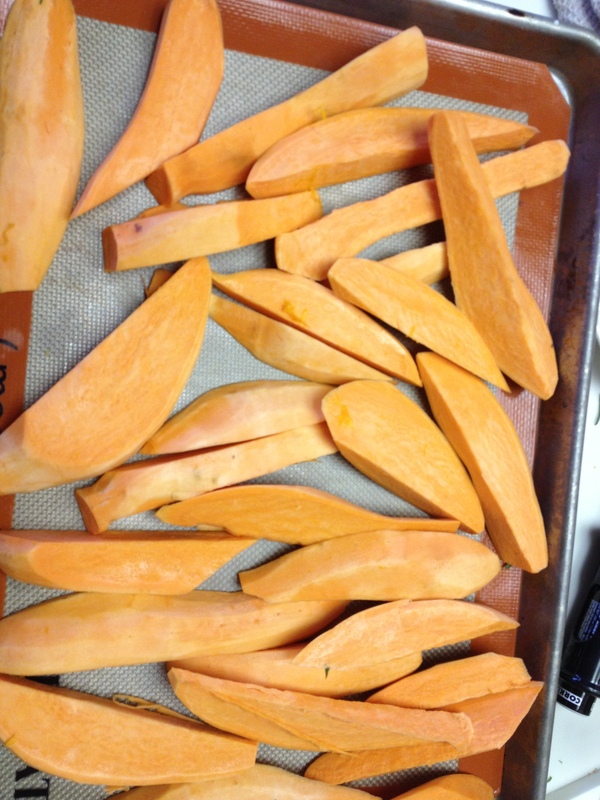 Peel the sweet potatoes and cut them lengthwise into wedges. 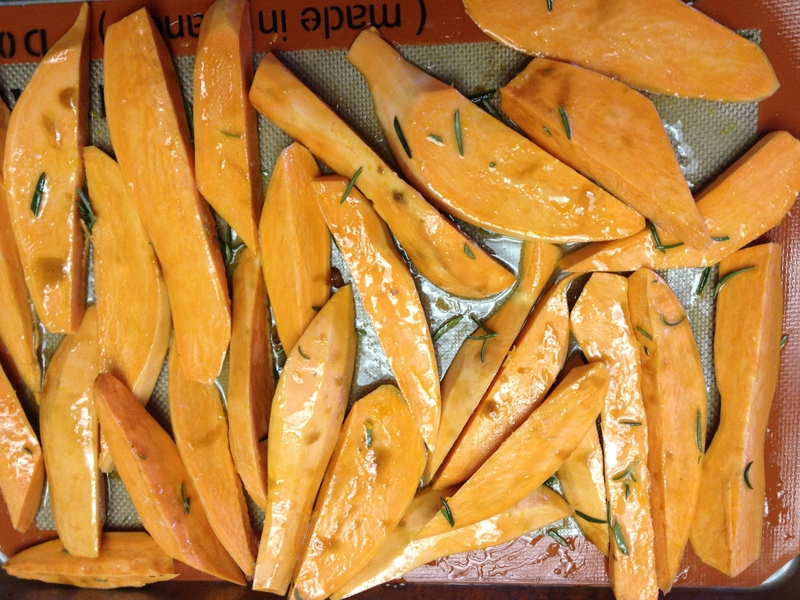 For three large potatoes, I melt about 1/4 c of butter, 1 tablespoon of brown sugar, the grated zest of an orange, and about 1-2 tablespoons of fresh rosemary. You should have enough butter to lightly coat the food. Put onto a lined jelly roll or shallow roasting pan, in a single layer. Roast, uncovered, for about one hour, turning once during baking. You want the potatoes to be very soft, and the edges starting to look caramelized or even a tiny bit “burned” on the edges. That’s it. The potatoes are savory, with just a bit of the brown sugar to help the surface caramelize. When serving, we sprinkle with a bit of sea or kosher salt. Enjoy, and leave the marshmallows to the campfire. This looks great. My sister used to zap them whole in the microwave and give a whole yam to her kids to gnaw on. It was a healthy snack and they loved it. I don’t like sweet foods, either. There are some parts of the US that have sticky sweet barbeque sauce which I find appalling. I like the vinegar or mustard based ones, not flavored ketchup.